Award-winning writer , journalist, poet and musician, Devon L. Muhlert has worked on artistic projects for decades. Winner of the 2011 Okanagan Arts Award in Literary Arts, she also previously won the Shari Meakin Bursary based in Burnaby, B.C., a suburb of Vancouver. Called the female Dave Barry, her humour column Devon’s Delusions ran for five years in magazines and a regional newspaper. It pokes fun at a world that takes itself too seriously. Other publications include a short story in Queen’s Quarterly out of Ontario, and articles for Okanagan Arts Magazine and translations and articles for the International Choral Bulletin based in Belgium. Muhlert has also been writing Late Dialogs for years, transliterating and then translating her mother’s diary from pre-war Germany. The novel is the saga of a mother-daughter relationship gone wrong. Also a composer, her choral works have been used in Australia, Canada, the U.S. and Israel. 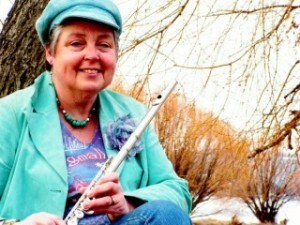 She released 2 CD’s with original flute music, one for meditation and healing, and one for listening. She leads music meditations, with people writing Haiku afterward to crystallize their experience. Haiku has become a passion with her, because each Haiku is an idea conveyed all in one breath. Most recently, she was named a poetry finalist in Pacific NW Writer’s competition based in Seattle. She continues to teach music privately: guitar, flute, saxophone and therapeutic singing as well as songwriting.